Our Periwinkle Cross Christening and Baptism Plate will mark this important occasion in a special way. 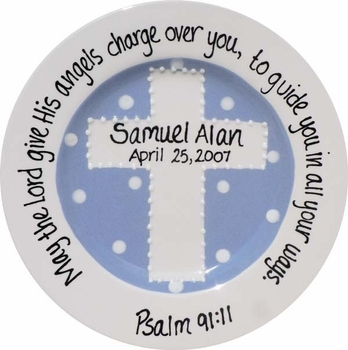 The plate features a hand painted cross on a periwinkle background and is finished around the trim with a prayer. Make it extra special by personalizing it with baby's name within the cross. The back of the plate can also carry your personal message (eight words maximum) for the most perfect gift! This periwinkle blue color works for a baby boy or girl. All plates are dinnerware and dishwasher safe. Prayer #2 reads: Father in Heaven hear my prayer, keep me in Thy loving care. Be my guide in all I do. And bless those, Lord, who love me too. Amen"
Prayer #3 reads: "May the Lord give his angels charge over you, to guide you in all your ways. Psalm 91:11"
This item is custom made upon order and ships directly from the designer. Please allow extra time for shipping.